Red itchy eyes? Sore throat? A runny nose and a headache? Sounds like you have allergies. With countless mold spores, pollen, dust, and dander to deal with, allergy-proofing your home may seem like a tough task to tackle. The first step to allergy-proofing is to discover the extent of the issue through Air Quality Testing by Cowan Inspections Group. 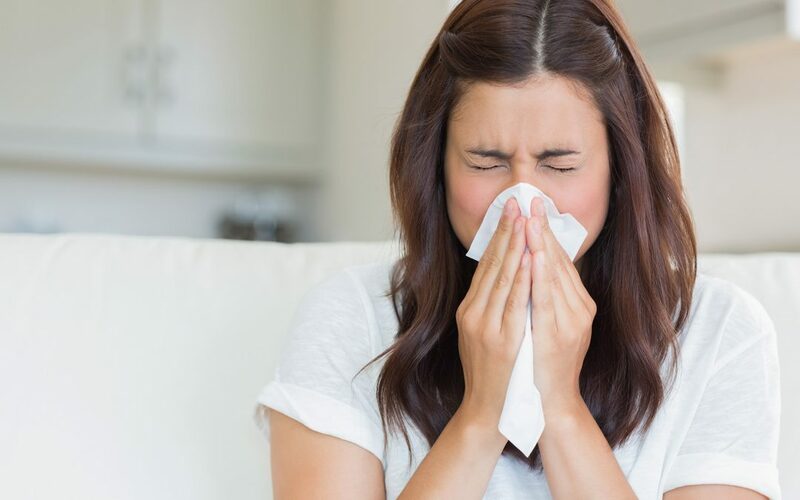 We’ve listed some tips below to help keep you sneeze-free no matter the season. Put high-efficiency particulate air, or HEPA, filters in your air conditioner. Control the humidity level in your home by using a few dehumidifiers, and keep humidity levels around 50%. Mold is happiest when there’s moisture around, and pollen and dust mites like to occupy drier air. Be strategic about where you place your dehumidifiers; begin by putting one in the basement, the bathroom, and your kitchen. Be sure to keep the filters clean otherwise you risk giving mold yet another perfectly-suited place to grow. Close your windows when pollen counts reach their peak—when there’s wind, at daybreak, and between 10 am and 3 pm. Have you ever claimed that your home isn’t dirty—it’s just cluttered? Well, think again, because allergens love to contaminate your clutter. If you have old newspapers or magazines piling up, throw them out or recycle them. Porous materials like paper and cloth often harbor allergens, so wash that pile of clothes you’ve let sit for too long while you’re at it. Spend the greater part of your de-cluttering energy in your bedroom. That’s where you spend most of your indoor-hours. With so much moisture from steam and running water, it’s likely that mold is growing in your bathroom unless you take precautionary steps to eliminate it. Regularly clean fixtures and pipes, and check for (and fix) any leaks. Clean from top to bottom using nontoxic cleaners, and do so often. Keep your ventilation fans running for at least 30 minutes after taking a shower or bath. Not only do carpets, curtains, and rugs harbor dust—they create more as their fibers break down. Choose short, low-pile carpeting, and clean with a HEPA filter-equipped vacuum weekly. Use washable rugs on your floors. Dander produced by your pets is far lighter than most allergens. You’ll likely need an air filtering machine to help you reduce it, although bathing and grooming your pets regularly will also help. Don’t choose an air filter that is “HEPA-like”—it may be cheaper, but it won’t work nearly as well. Air filtering units for single-room use are thought to be better than those intended to filter your entire house. If you are experiencing allergy symptoms, contact Cowan Inspections Group and schedule our Air Quality Testing service. We can help determine which allergens are present and at what levels, and make recommendations about what steps to take to ensure your air quality is safe and healthy for your family!